Through mismanagement at DHHS and improper estimates, the Governor manufactured a budget shortfall to justify cuts in services for Maine’s most vulnerable. If his proposal passes, 56,000 people lose health care; 40,000 seniors and people with disabilities lose prescription drug coverage, 5,000 seniors and disabled adults will lose their homes, and hundreds of thousands more will lose access to specific medical services and treatments. MPA has joined with many allies, including the Maine Medical Association and the Catholic Church, to propose a Responsible Solution: roll back the LePage tax cuts for those making over $200k; make the top 1% pay an effective tax rate equal to the average Mainer, and address real long-term cost drivers in health care by emphasizing prevention, case management, and payment reform. Please visit www.responsiblesolution.com to voice your support for our plan! To date, there has been lots of back and forth in the Appropriations Committee, but so far legislators have not been able to put forward an alternative to the Governor’s plan. This bill would disproportionately target the low-income and Mainers of color. As originally proposed, people could be imprisoned for up to 40 years for belonging to or recruiting for a gang. The definition of a gang raises many constitutional issues around freedom of expression and assembly, and would compromise the trust between law enforcement and the community necessary for good police work. At this point, we are optimistic that the bill will be amended to simply direct law enforcement to come up with a gang policy, as all the criminal activity the bill seeks to deter is already a crime. Passed unanimously out of committee, Senator Alfond’s bill goes a long way to addressing the many disparities—especially racial—in our educational system regarding school attendance and achievement. It ensures districts track the data necessary to determine where problems are, and promotes policies to deal with disciplinary issues that focus on resolving problems in ways that most effectively keep students safe and learning. We believe this bill’s passage will be one of the few positive things that will happen this session. Backed especially by our partners in the LGBT community, this bill ensures students will be free from bullying—both online and in schools. As we expect this to finally pass after being carried over from last session, school boards will now be directed to create policies to adequately deal with this issue. LDs 1497 and 1498: Implementation of Federal Health Care Reform. Introduced by Rep. McKane (R-Newcastle) and Rep. Treat (D-Hallowell). We oppose Rep. McKane’s bill, LD 1497, and support Rep. Treat’s bill, LD 1498. The Affordable Care Act gives states wide latitude to implement federal reform. The major issue is that of the exchanges, or the place where people will buy health insurance. It’s meant to be a one-stop place to easily compare all of one’s health insurance options, as well as a regulator to leverage our consumer power in Maine to negotiate with health insurance companies. Unfortunately, Rep. McKane’s bill does not allow the exchange to be as active a regulator as possible, nor does sufficiently ban conflicts of interest in its governing body. Rep. Treat’s bill is much better on both counts. LD 1607: Expanding health care reinsurance to the small group market. Under the health insurance deregulation bill passed last year, LD 1333, health insurers in the individual market can now pass off the costs of insuring sick people onto an umbrella insurance organization, funded by a new $4/person/month tax on anyone with a private health insurance policy in Maine. In addition to this being a huge giveaway to insurance companies—what are they for if not to pay for health care for sick people?—there is no reason to believe this “reinsurance” scheme will be financially sound. We therefore oppose expanding it to include people in the small group market. Sick people need care, not risky financial schemes. Tax insurance companies, not patients. It sounds crazy, but big banks don’t want to produce the original paperwork to prove that they have a right to foreclose. Last year, the judiciary committee recommended the legislature pass this bill. But the big banks convinced Republican leadership to send it back to committee before it could get a vote. Now it’s stuck there as the banks try to water it down. LD 1685: Taking Away Overtime from Truckers. Introduced by Rep. O’Connor (R-Berwick). Under federal law, truck drivers—along with others like farmers and domestic workers—don’t receive basic worker protections like overtime. In Maine, we did the right thing and made sure truck drivers had that basic protection. It’s good for them and their families; it’s good for public safety because it reduces the incentives to push truckers to drive while tired. This bill is an insult to working Mainers. LD 1725: Making it Harder to Get Unemployment Insurance. Introduced by the Governor. Instead of creating jobs, the Governor is going after the unemployed. It’s a lot easier to scapegoat the jobless than fix the economy. Although Maine has one of the lowest unemployment fraud rates in the nation, he wants the authority to revise work search requirements without legislative oversight, kick people off the program if they have childcare or transportation emergencies, and force high-skilled workers to accept lower paying jobs in half the time. Because the Supreme Court is confused and thinks corporations are people and money is speech, our Clean Elections law has been gutted. Before, candidates that ran “clean” would get public money that matched whatever private money was spent against them. It leveled the playing field and reduced the influence of big money in politics. After the Supreme Court ruled that unconstitutional, Democrats have come up with many alternatives to replace this key “matching funds” provision. Unfortunately, none of them have found bi-partisan support, and many Republicans would like to use this opportunity to gut the system and allow an unprecedented level of money in politics. This is another voter suppression bill. 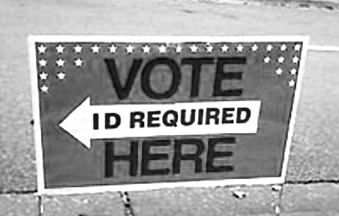 Ten to fifteen percent of Mainers don’t have a government issued photo ID. Denying people the right to vote because they don’t have ID discriminates against these Mainers, who are disproportionately the young, the old, the low-income, and of color. It’s another gimmick to shut working families out of the political process so the rich and big corporations can run the show.